Life is a series of train rides. You board somewhere with a destination in mind and along the route, you meet people headed to the same place. Sometimes you decide to get off and take a different train to a new location that may or may not just be a detour to your original destination. The best part is when you meet someone on that life train who just came from the same train as you and yet is going to the same place. Making a life train buddy is like making a new BFF. Such was the case with Seth Unger and me. Seth, much like me, has been in the entertainment business for years. Managing artists, working with record labels, TV and putting on shows. 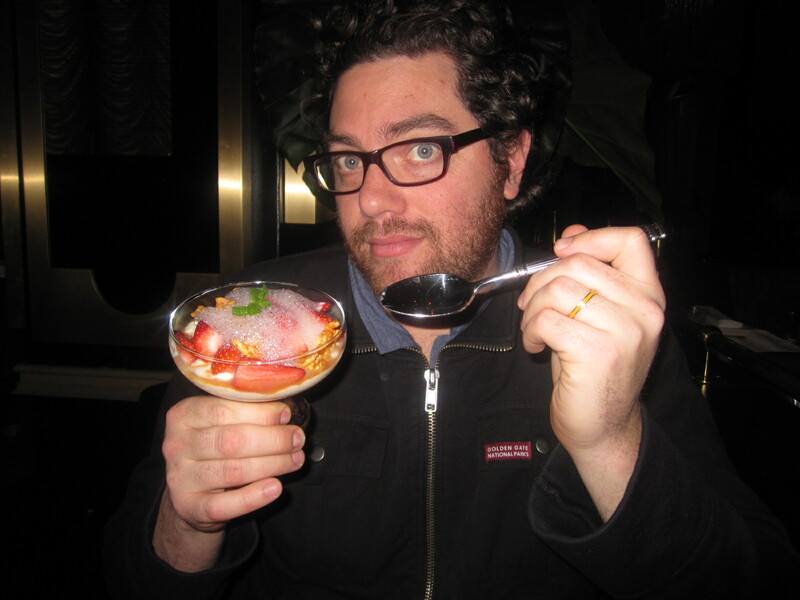 Somewhere along Seth’s journey, his passion for food sent him in another direction. Long story short, Seth now manages burger-czar George Motz, author of “Hamburger America,” the 150 guide to fantastic US burger joints. 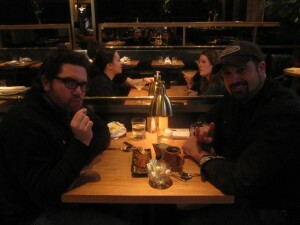 Seth also works with George to run, organize and deal with sponsorships for the NYC Food Film Festival. Again, much like me, Seth ended up on the food train by no design. 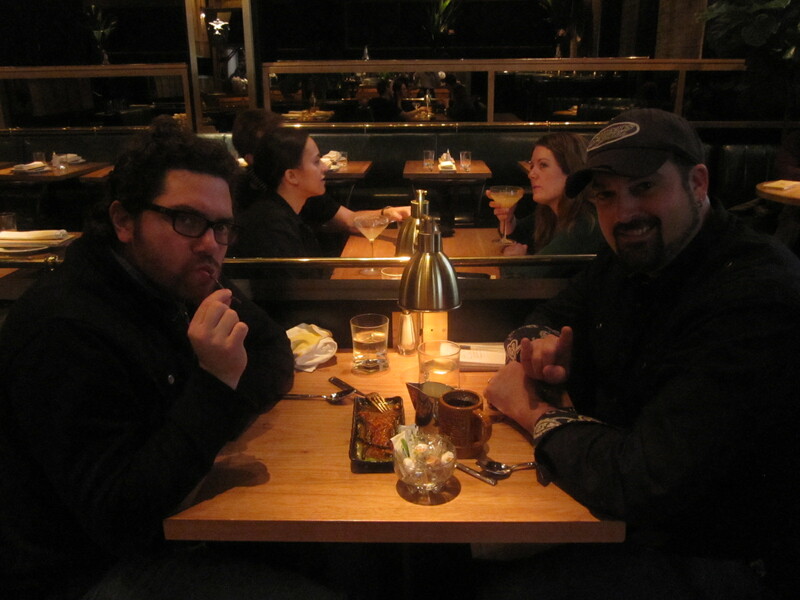 Seth and I recently met up to chat (and chew) about potential work we can do together. If you spent a significant portion of your life in destinations like Disney World, Cedar Point, Universal Studios and Chuck E. Cheese, you’ve grown up enjoying themed experiences. Now you’re all grown up and other than taking your own kids or the regrettable visit to Dave & Busters, these experiences are a thing of your past. However, if you live in NYC, there is an option for adults, intro The Hurricane Club. 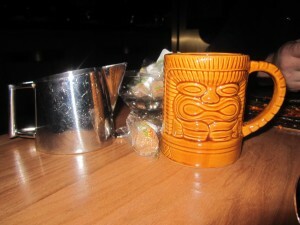 It’s a Polynesian themed, tiki restaurant that could double as the set for a Broadway version of Casablanca. 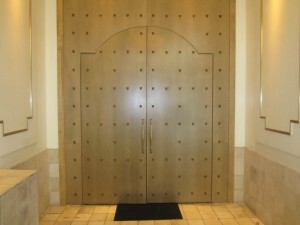 Before entering through their massive, double Gothic doors, be sure to read the legend of “The Hurricane Club” on their website as the story of “Goldbelly” and “Little Rose” is to long to re-tell here. Known primarily for their Pupu platter, the restaurant also offers up salads, skewers, seafood, ribs, noodles and of course burgers. 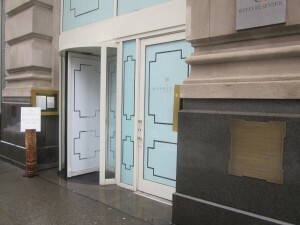 While you are waiting for you order to come up, take a quick visit to the basement where, if you’re wearing leather shoes, you can get a “Rum & a Shine.” It’s a large place with several rooms available for private parties. Ever since I tried the burger from The Hurricane Club at the NY Wine & Food Festival Blue Moon Burger Bash, I’ve been dying to pay a visit to the restaurant. This was my excuse. When it came to ordering, neither Seth nor I could pick between 2 of the burgers on the menu and did the only thing that 2 passengers on the same train should do, ordered both to split! 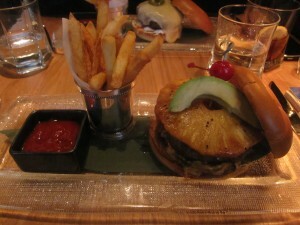 These 2 hulking masses were some of the best looking and dressed burgers I have ever had the pleasure of gorging on. The award was clearly well deserved! I became especially excited with the single chile placed atop the Fire Eater. After a few mandatory photos and loudly exclaimed “whoas!” I decided to make it happen. Picking up the Big Kahuna was more like grappling with it. The mass of the sandwich was matched only by it’s mess! 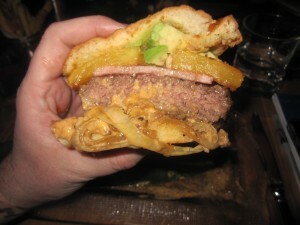 This burger is not for the neat freaks or people with OCD! I tried my best to keep it some semblance of order as I ate it but that only became more difficult with every bite. Most burger joints will opt for a savory profile when building a burger full of toppings but this was clearly a stab at the sweet. 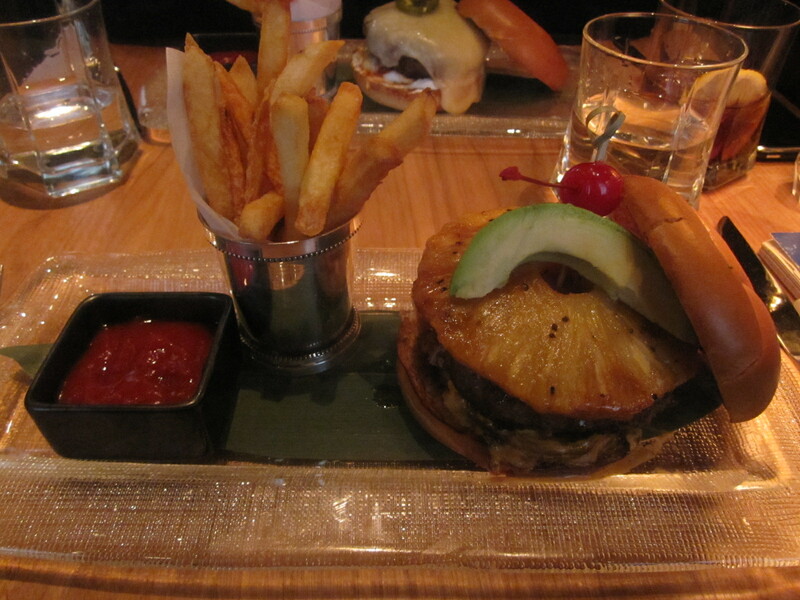 Were the beef patty not so massive, it would’ve been lost in the sugary palette of the flavor combination’s. Honestly though, it was your friend the avocado that really served to draw it all together. Before moving onto the Fire Eater, my hands and face required a full napkin wipe and discharge. I felt like a 2 year old in a high chair as if I was intentionally trying to rub food on my face. 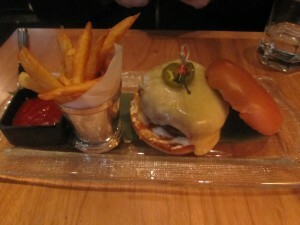 Of the 2 burgers, I preferred this one but that is not to say I didn’t thoroughly enjoy them both. It’s moreover, much like Buster Poindexter, I like it hot. The burger is no less messier than it’s sweeter brother, the Kahuna but with all the peppered elements, a completely different taste sensation. It’s not so hot that it warrants a waiver but it’s definitely not for the weak of tongue. 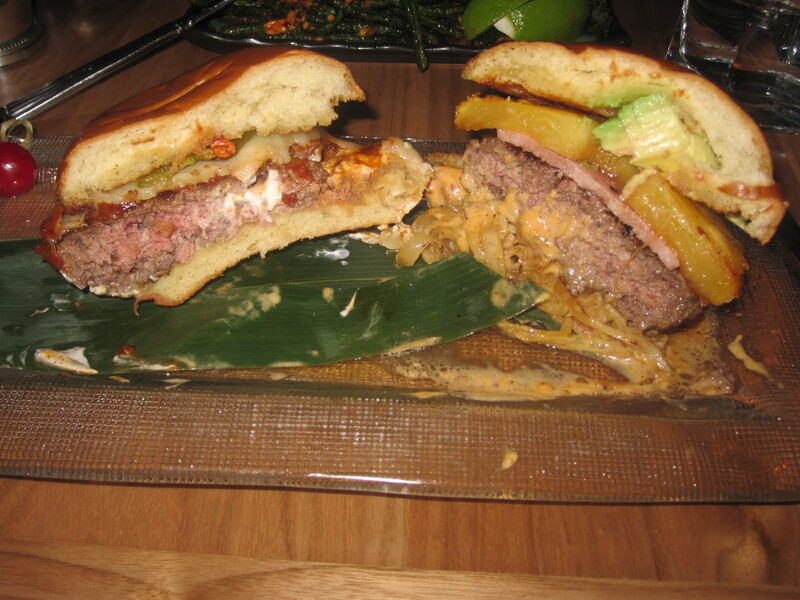 The hot spiciness only adds to the savory nature of this juicy island monster. Oddly enough, as unique as these two burgers may have been, neither of them were the star of my lunch. It was an unassuming side that ended up my favorite part of the meal. 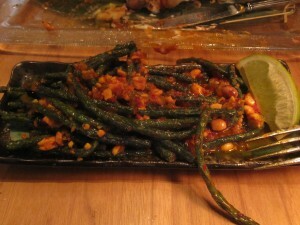 I ordered us the Chinese Long Beans with Sweet and Spicy Peanuts, think we could just use some greens and after only one bite, I thought Seth and I were about to enter a dog fight to finish them off. 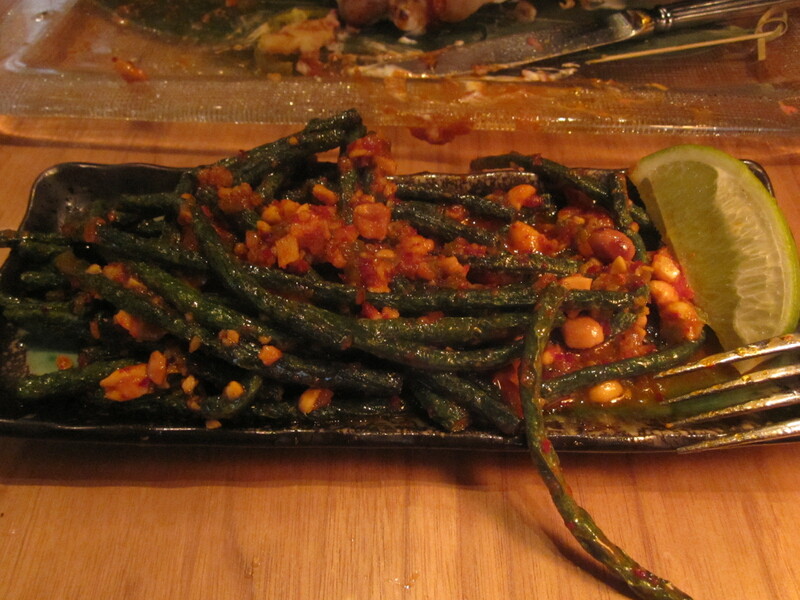 The beans were garden fresh and covered in an intense sauce that was equally sweet, sour and spicy. No taste is spared on these and honestly, I would go back to the Hurricane just to eat them by themselves!!! 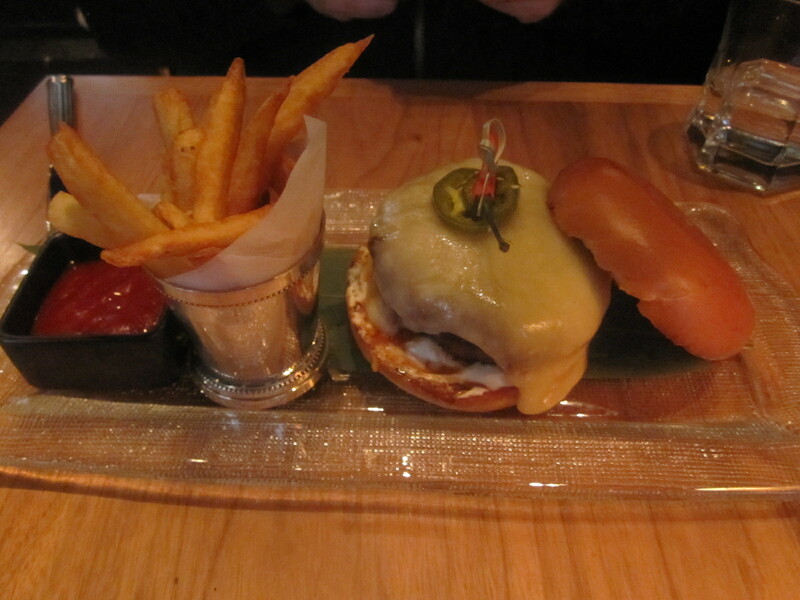 And, much like their burgers, this dish was placing itself equally on the messy scale. Whereas a real trip to Polynesia might require sunscreen and sunglasses, the food at the Hurricane club requires patience and napkins…lots of them! It was the biggest mess I’ve ever made at a non-BBQ restaurant in my entire, train riding, adult life. This entry was posted in Bar, Burgers, Gourmet Burgers, Uncategorized and tagged big kahuna, burger, cheese, ciancio, conquest, fire eater, french, fries, great, hamburger, hurricane, hurricane club, new york, ny, nyc, pupu platter, rev, review, rum, the, tiki, tikis. Bookmark the permalink.